If we bear in mind that ‘a perfect larger pond’ is only a series of ‘perfect smaller ponds’ – hopefully each overlapping the next then, after taking in base dimensions and drainage requirements, we can then move to the next stage. 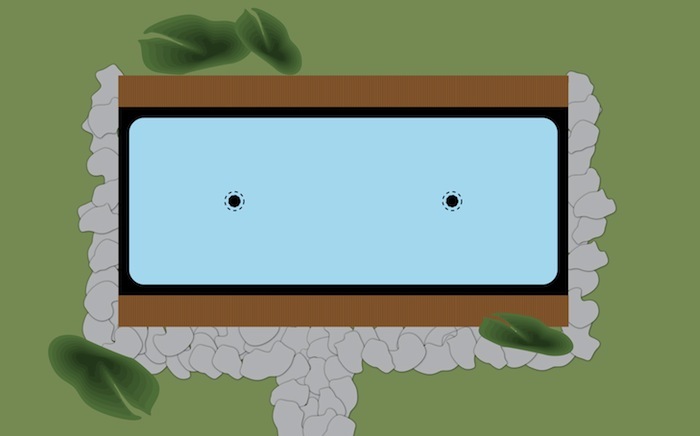 To give a contrast to the perfect smaller pond already covered, this design will be for a more formal pond that is partially raised above ground level. The internal pond dimensions of this example are 8.5m x 4m x 2m deep producing a volume of 68 tons or 15,000 gallons. It should also demonstrate in this design how the build cost of filter walls can be reduced by around 50% by sharing a common wall with the pond walls. With these base dimensions in mind, the logical place to site the two drains required is by dividing the pond base into two 4.25m x 4m sections and then drawing laterals from corner to corner of each section. The drains are then installed dead centre as shown. Each drain therefore will be required to service the base of an individual ‘pond’ containing 7,500 gallons. 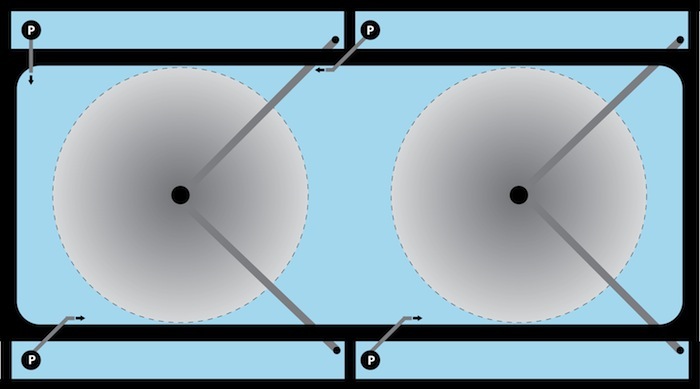 The illustration shows the base area that will be serviced by linking each drain directly to each filter if the vital ‘One Drain to One Filter to One Pump’ principle is to be followed. Alas, in this example the flow rate that will be required through the filter box in order to give perfect coverage of the biological surface is too small to be able to service the pond base properly as can be seen by the grey areas. By adopting this next method shown and then taking each drain to two separate supply lines and thence to two filters, then the pond base is serviced admirably. The reason being that the output flow from the bottom drains has been doubled whilst giving perfect flow rate to each filter. The drains can be standard outlet models taken to an equal tee piece and then fitted with 90 degree or 45 degree elbows as required, or they can be custom-made to your requirements. There is little difference in the end price whichever option you take. Please also note, this design shows how return lines from filter to pond can be reduced dramatically in length, thus allowing the pumps to perform at maximum efficiency. This shows a possible landscaping option for this design. The final water level of the pond is 50cms above ground level that ties in with the depth of the filters themselves. All the 4” filter drain lines and overflow have been installed during the wall build as have the return lines and now are completely disguised. The wooden decking used will include hinged cover inserts for rapid servicing. This is how the finished and very compact system will look as far as the most important parts of ‘filtration’ and ‘pond’ are concerned. This should also show how incredibly economical, simple and uncomplicated a ‘proper large system’ could be built today without compromising on any aspects in the slightest. Obviously, other items are required such as skimmer/s, U/V unit/s and heating but it is recommended that these are all incorporated in separate lines away from operation of the main system itself as described in ‘The Perfect Small Pond’ page.